Now that you are aware of how to train people for implementing a Lean or Six Sigma strategy in your organization, the next step is to move towards sustainability. Training the right personnel is just one part of the changeover but– it is not enough to sustain a Lean culture in an organization. For developing a Lean culture, it is essential that you promote the changeover to Lean within the organization – the focus should be on getting everyone involved and sustaining continued improvement. If you stop following Lean practices when everything seems under control and stable, you will soon see that everything will become out of control and unstable. This is because Lean Six Sigma is not just a ‘quick fix’ that can add to your organization’s management strategy but instead, it is a complete strategy on its own. 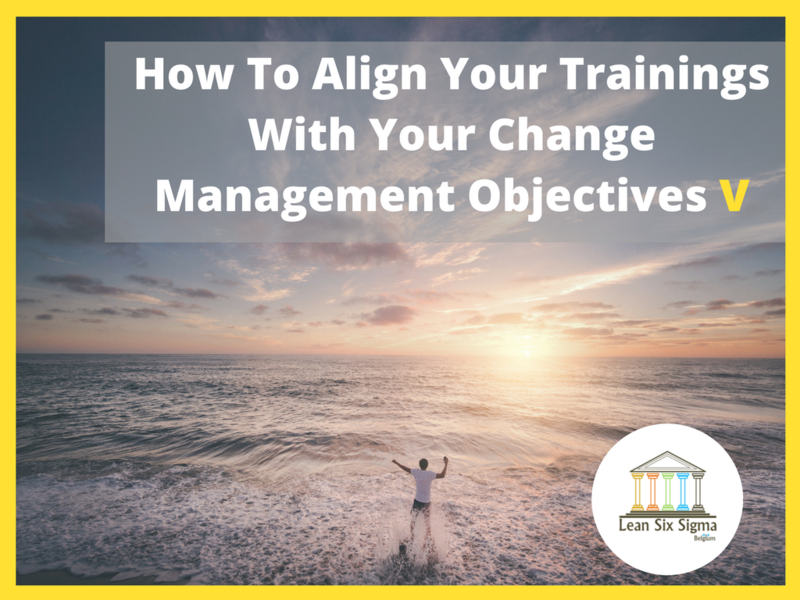 So, how can you align your training with the change management objectives of your organization? Lean is not just about refining processes and improving their efficiency but instead, it is a strategy that thrives for continuous improvement within an organization. For achieving the maximum benefits from Lean Six Sigma, the philosophy of Lean should not just be focused around the Lean Six Sigma team but should also work in conjunction with everyone else, as well. Lean Six Sigma tools and techniques should not be restricted only to DMAIC projects but should be applied to all business operations within an organization – this is the Lean management philosophy. At the center of the Lean philosophy are the customers and the focus of every Lean organization should to generate more value for the customers. The ultimate goal of this strategy is to provide the perfect value to the customers with the perfect utilization of processes with zero amount of waste, which in turn, leads to a high return on investment for the organization. One of the most common misconceptions about implementing Lean in an organization is that it will take effect within a short period of time. What you need to understand is that adopting Lean Six Sigma is not a ‘quick fix’ to your problems. Lean is an organizational culture that can take a number of years to perfect and this is the reason we have recommended a five-year Lean deployment roadmap. This is because the Lean culture requires you to change your management system entirely – everything from the way of working and communicating to the responsibilities of employees need to be overhauled for the transformation to Lean. What is important is that once you have started the transformation program to Lean, you should never let old habits and methods slip back. The goal should be to adopt the Lean philosophy and this new vision for your organization through persistent reinforcement. The reason that most organizations fail in sustaining a Lean culture is because they focus entirely on the tools and techniques of Lean. The Lean culture is not just about the tools, but instead about the people within an organization, as well. We believe that 80% of the Lean implementation is based on the culture side of an organization i.e. the working habits, belief systems, responsibilities, implication of people, and empowerment of employees. Creating a Lean culture is about getting everyone within an organization involved with the changeover – to remove waste wherever it is possible, to act on facts and statistics (not opinions), and to work together as a team. The Lean culture is about continuous improvement, not just with the business processes, but for the employees within an organization, as well. It is not about what we do but how we go about activities and aligning the Lean strategy with an organization’s goals. Putting the focus on the people is the responsibility of the Lean leadership and management within an organization. The leadership for the initiative has to constantly reinforce the same message across the organization and involve everyone for ensuring a sustained changeover. The true transformation to Lean must start with the people and every employee of an organization should be involved with the change. This does not mean that they should be trained rigorously about Lean tools and techniques, but instead, should be made aware of the Lean methodology and what changes are expected from them. How To Develop A Lean Culture? The focus of Lean is to provide utmost levels of customer satisfaction and without the customers, there would be no need for Lean management. Therefore, in a Lean culture, making the customers happy and content should be the ultimate goal of your organization. For achieving this goal, you should make sure that customers are the topmost priority of everyone in your organization. Every employee should be made to realize that their wage is being paid by the customers and thus, it is their responsibility to contribute to customer satisfaction in whichever way they can. While it is not possible to standardize everything – it is always a good thing to standardize some parts of a manager’s work to ensure that everyone delivers on the same level. For doing this, you can prepare a list of tasks that each manager has to accomplish each day/week/month that will make it easier to assess the effectiveness and performance of a manager. The managers play a key role in the Lean culture and they should have sensitive eyes and ears for everything that is going on around them which is why it is important to ensure that these managers are performing up to the mark of the requirements. One great way of ensuring consistent and continuous improvement is to have accountability meetings regularly. In these accountability meetings, you discuss what happened on that day, who performed well (and who did not), and how you can achieve better the next day. These meetings should be brief and you should not be sharing unimportant information or having long discussions in them since this would be a waste of time. Keep it short, give credit where it is due, assign relevant responsibilities, and discuss important information to earn maximum benefits from these meetings. There is no better way to teach something than by demonstrating it and this rule applies to the Lean methodology, as well. The leaders of the Lean Six Sigma initiative should be willing to take charge and show how to work within a Lean organization. The Lean culture will not develop in your organization unless you are willing to set examples for the new behaviors that are to be adopted within the organization. This will automatically breed a culture of continuous improvement and sustainable growth within the organization. For instance, if you are a supervisor then you should never just ‘walk by’ when you see a chance for improvement in work conditions. You should take action and make sure that there are no ‘unsafe’ or ‘dirty’ work conditions in the organization. Training is just one part of Lean Six Sigma implementation – for a sustained changeover, you need to align it with the change management objectives of your organization. It is important to understand that the Lean philosophy is not just about a quick fix to improve efficiency of processes in a business but it is a organizational culture that looks to perfect customer satisfaction and value utilization. The Lean transformation does not happen overnight – it takes constant reinforcement and continuous efforts to sustain the changeover to Lean Six Sigma. The focus of a Lean implementation should not be entirely on training, tools, and techniques. Instead, it should focus on the people and employees – the transformation should implicate them and empower them. To develop a Lean culture in your organization, you should: Keep everyone involved with the customers, standardize work for the managers, hold daily accountability meetings, and provide role models that everyone can follow.